Weekly BLOG: What do you see in Tia’s eyes? 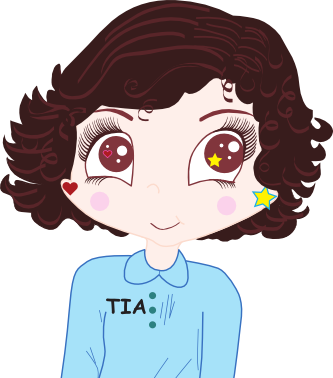 Tia is the little character and symbol of our company Touch a Heart with TIA. Her initials come from The Inside Advantage® which is a term we use to describe living deeply, joyfully, and successfully. By the way, Tia always wears two different styles of earrings; this is her favorite pair! If you look closely at Tia’s eyes, you will see a little heart in one and a bright star in the other. Why? What does that mean? Our HEARTS are about FEELINGS and our MINDS are about THOUGHTS and IMAGES. Think about this: we feel differently depending upon what we think about, right? You think of a beautiful sunset at the beach and remember a time you were there—the smell of the ocean, the sounds of the waves and seagulls, the soft sand and the cool breeze gently blowing across your face—those thoughts probably make you feel happy. If you think unpleasant or scary thoughts, you will more than likely feel bad or afraid. Thoughts first, feelings second, and they go hand-in-hand. Each night Tia dreams of whatever she thinks about—whatever she focuses on—before falling asleep. And, she has something very special to help her have SWEET DREAMS. Shhh…we’ll tell you her secret next week, if you don’t already know. I’ve learned that we must lift ourselves up when we need to feel better, because no one can do it for us. Others can certainly help, but it’s up to us to let take what they give us and put it in our minds and hearts. Hoping that your eyes also reflect love & wishes. This entry was posted in Raising Children to be Successful Adults, The Mind, Touch a Heart with TIA and tagged Cathy W. Lauro, falling asleep, how to be happy, living deeply, Love and wishes, successful living, sweet dreams, The Inside Advantage, Touch a Heart with TIA. Bookmark the permalink.